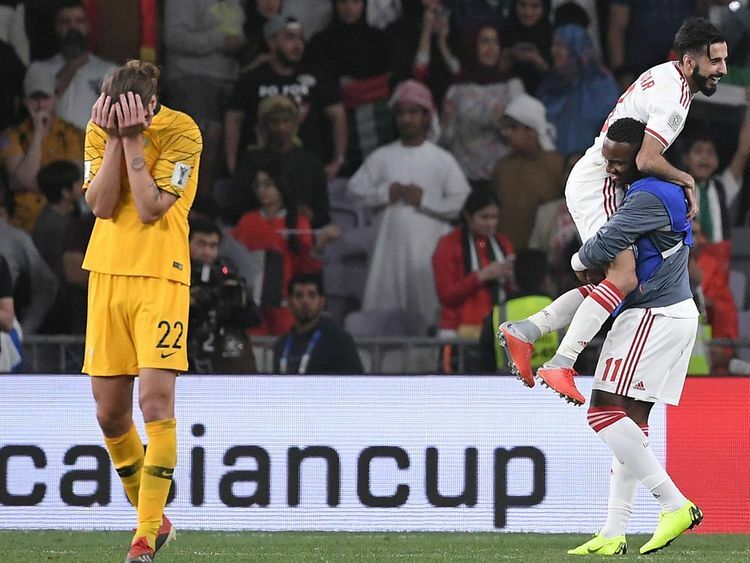 Abu Dhabi: A solitary second-half goal from Ali Mabkhout allowed UAE to stun defending champions Australia 1-0 to enter the semi-finals of the AFC Asian Cup at the Hazza bin Zayed Stadium on Friday. At half-time 0-0. With this win, they also avenged their semi-final loss to Australia in the last edition of the tournament. The hosts will be now meeting Qatar, who defeated South Korea by a similar margin riding on a goal by Abdulaziz Hatim. Unlike the previous encounters, UAE fans were right behind the home side for this crucial outing against the Socceroos and pretty much every seat in the stadium was occupied. The atmosphere was electrifying right from the start and the stage was perfectly set for an intriguing contest. The first quarter comprised of midfield duel with both sides trying to get a measure of each other’s strengths and weaknesses. UAE defense that was reeling in the absence of injured defender Khalifa Mubarak also lost Mohamed Gharib in the backline in 18th minute. However, Khalifa Al Hammadi, the right winger from Jazira who replaced Gharib, did well to rise to the challenge. UAE had a golden opportunity to get the breakthrough in the 20th minute when Majed Hassan made a fine run from the centre to set it up for Ismail Al Hammadi. The midfielder then made a defense splitting run but his shot was well kept out by an alert Australia goalkeeper Mathew Ryan. In the 27th minute, Australia’s Jamie Maclaren sent in a header from the centre of the box after being fed by Rhyan Grant, but it went just wide. The Aussies piled on some pressure by pushing forward but UAE defense remained watchful and kept thwarting their efforts once inside the box. Just before the breather Ali Mabkhout saw his powerpacked header following a free-kick from the veteran striker Ismail Matar from right go just over the framework. Trailing by a goal, the Australians pressed and tried to bring the long ball to good effect but UAE defenders remained alert and kept them at bay till the very end to steal a memorable win. Five minutes after the change of ends Matar was replaced by playmaker Mohammed Abdul Rahman and the midfield started functioning better. In the 60th minute, latching onto a through from Mohammed Abdul Rahman, Al Hammadi had the Aussie defense in a spot of bother but ran out of ideas once inside the box. A defensive lapse in the 68th minute allowed UAE to take the lead and that triggered wild celebration amongst the fans. Cashing on a blunder from defender Milos Degenek, Mabkhout dribbled past a hapless looking Australian goalkeeper Ryan to slot it home with ease. Mabkhout, with that effort now have nine goals in the Asian Cup tournaments; only Iran’s Ali Daei (14), Korea Republic’s Lee Dong-Gook (10) and Japan’s Naohiro Takahara (9) have scored more in the competition’s history. Australia then tried everything possible till the final whistle but UAE defense stood firm to register a memorable win.